Hello kind friends and readers. Thank you for the patience and for checking in periodically to see if I would show up again. I’m still here. Time just decided to go into overdrive this past month. It has been just over a month since my last post, but not a lot of things accomplished in the quilting realm. Work is busy. The kids went to summer camp every day and got to swim every day, which they loved. But that is over now. We just came back from a vacation getaway to Moody Gardens in Galveston, TX. It wasn’t a far drive from home, and in fact – my husband made an early morning trip back half-way through to get some cheaper snacks for the hotel room and a few forgotten items. Most of the time was spent in the water. I’m very tired of being wet and bound in a swimsuit. I bought my first swimsuit in 8 years for this vacation and I couldn’t believe how much those things cost. Especially ones that offer the … ahem… full coverage that I was looking for. On a very sad note, I don’t think I mentioned that all 5 of our kittens tested positive for Feline Leukemia (FeLV). This is like contagious cancer for cats. It doesn’t spread to humans or other animals, like dogs. I had to go through the sorrow of losing 3 kittens in one day, then another kitten three days later. They are just over 5 months old and they fall so fast. All four that have passed had respiratory distress due to fluid building up in their bodies and starting to choke out their lung capacity. We have one kitten left – Olaf. When I took her in with the other sister, I had noted the night before that she had some cloudiness in her eye. The vet said it could be a tumor starting or just an eye infection. I have since taken her to the kitty ophthalmologist and they prescribed some steroid drops for two weeks to see how she reacts. They don’t think it is a tumor (relief). Her eyes are looking better already, but she will always have this underlying condition that I can’t control and at this point and I am so sad to know that at any time she may not make it past another few days. FeLV opens the door for infections or cancers to just come right in and take her down. We are doing what we can within our means to give her a comfortable and happy life and right now she is good. So, I had been busy and depressed and not in much of a mood to sit and sew. Because that is usually a happy time for me. I don’t normally do ‘sad sewing’ or ‘angry sewing’, if you know what I mean. There were a few days here and there that I found myself doing some piece work. I am working on Block #11. The folded stack of fat quarters is for another quilt that I haven’t started yet. And the clear envelope on the right side of the picture holds the first shipment from Fig Tree Quilts of the MODA Modern Building Blocks BOM program! Here are the pattern covers for Block #12 (the last block) and Block #2 of the new series that will be done next. I will be caught up after these are done. I’m super excited about Fig Tree’s version of the MODA Modern Building Blocks quilt. It was offered through their website a couple of months ago, but it sold out quickly. Fat Quarter Shop is also offering this as a kit in September 2014. Here is a link to their site for that kit (click here). In the first shipment, we received three cuts of Bella Solids. This fabric will be used to make five of the blocks in the pattern. One large block (36″) and four 6″ blocks. Their program is a total of 7 shipments. Finally, I leave you with a super silly picture from our vacation to Moody Gardens. I love these kids! Again, thanks for stopping by for a visit. I appreciate all of your emails and comments and hope to see you again very soon! I know it. But, you do the same thing! Don’t deny! 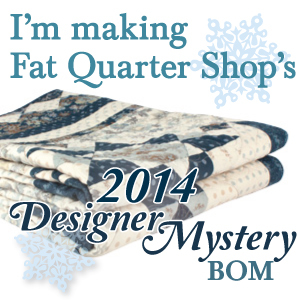 I got my box from Fat Quarter Shop yesterday and it had the first block of the 2014 Designer Mystery BOM program. This year it is featuring the collection Snowbird by Edyta Star of Laundry Basket Quilts and I think it will be all star blocks. But yes … I know … I have three blocks left to do on 2013 DM BOM … but they got pushed to the side last night so I could prep. I started by ironing and lightly starching all the fabric pieces. Don’t you love those blues with the gray and beige colors? It took no time to cut out the pieces for the block. In the the past two DM BOM years, I have tried to cut out two blocks from the same pack of fabric. Unfortunatley, at least on Block 1 this time, the cuts called for some large squares and I just couldn’t fit a second set out of the swatches. I might try again since all but one of the large squares got subcut diagonally twice, so I could possibly work it out as smaller squares for the extra block set. I’ll wait and see how Block 2 goes and I might invest in a layer cake to supplement. I wanted to make another quilt at the same time – I think my mom would like this one. As of this morning, FQS still had this program available along with the backing and finishing kits. It is going to be beautiful! Also, a quick look at my design wall where I’m laying out the pieced backing for my GGS quilt. I have some light gray solid on order to help finish it out. This one Great Granny Square will be about 60″ square when it is done. Can’t wait to see how it ends up! I wish you all a wonderful weekend and to those celebrating – a Happy Father’s Day!